I’ve been thinking a lot recently about sponsoring blogs. 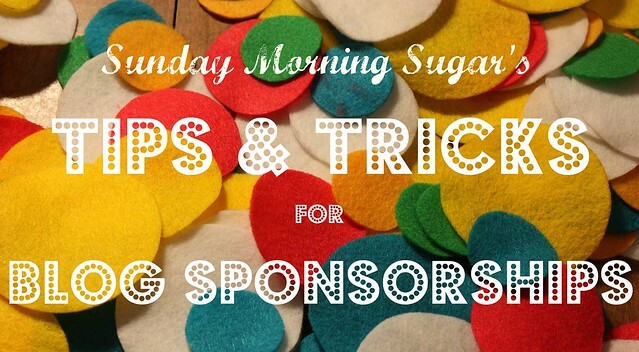 Over the past (almost) two years I’ve spent a serious amount of money to advertise Sunday Morning Sugar all across the creative blog world. When I first started advertising, I was a little confused about the whole process and I wasted a lot of money sponsoring blogs for the wrong reasons. I thought it might be handy to put together a post with the lessons I’ve learned so that if any of you are thinking about advertising your blogs, you’ll have a bit of insight into the best way to make that happen! Does the content on this blog complement the content on my blog? My blog is about food, crafting, and everyday life in a big city. I’m single, career-oriented and I don’t have any children. Miss. James over at Bleubird is a vintage-lovin’ mama and the month I sponsored her she announced she was pregnant. I RARELY wear vintage (or even shop for it, for that matter) and none of the content on my blog was appealing to new moms. It would be a bad idea for me to pay to sponsor a blog about motherhood because the readers of a mommy blog might not have much interest in the things I’m writing about. I’m not saying that I wouldn’t get ANY traffic but most of the readers at a blog on motherhood are probably there for content having to do with motherhood. It would be a much better use of my resources to sponsor a blog of someone who also lives in a city and enjoys food. If I make purses, advertising on a blog about finance would be a little bit silly. It would be much better to advertise on a style or fashion blog. What are the statistics of the blog I’m looking to sponsor? This is an important question and it is a question I didn’t know to ask until I had already spent hundreds of dollars on advertising. Yikes! Before you sponsor a blog, you should always ask about their stats. Most ladies have this information at the ready and are happy to share it with you, so don’t be afraid to ask. You want to know things like how many page views they get a day (or per week or month), how much time people generally spend on their site, and the demographic information about their readers. Is the audience predominantly male or female? What age group makes up the majority of their readers? The more information you can gather about the audience and the popularity of the blog, the better. You can use this information to further decide if it is a good fit for your blog. Almost all of my readers are women who are between the ages of 18-35. I have readers that don’t fall into that category, but the majority of you do. Using this information, I know that I want to follow a blog that attracts a large audience of young readers. I also want to sponsor a blog that gets a large number of page views each day because the more people that are visiting the site, the better chance I have of someone clicking through to my page. What is this blog going to do for me? Often, people forget that a sponsorship is a TWO WAY STREET! You want to get the word out about your blog, but the blog you are sponsoring wants to sell that sponsor spot so they need to make sure its a product that is worth your while. I’ll reference my sponsorship at Bluebird again to help explain. Miss. James does a fabulous job writing her blog. I adore her posts, photos, DIY’s, recipes, and her gorgeous family. But you might notice that she never calls attention to her sponsors. It might not seem like a big deal, but when you sponsor a blog that says “HEY! My sponsors are awesome, go check them out! !” it makes a HUGE difference. So when you’re looking into a sponsorship, see what’s in it for you. At the very least, look for a blog that will occasionally direct attention to their sponsors. Some bloggers will go above and beyond for you. Ilene of Much Love, Illy is a great lady to sponsor. Not only does she frequently do sponsorship shout outs, but she also offers giveaways from her sponsors, tweets about them, and does a roundup post featuring her sponsors. All of this extra exposure is awesome! Another fantastic lady to sponsor is Rachel of Smile and Wave. Her references to her sponsors are a little less frequent that Ilene but they’re just as great. When she posts her new sponsors, she gives them a little shoutout and before she takes them down she encourages her readers to take another peek at her lovely sponsors. She also does a roundup post and a giveaway which just draws more attention. One more example of this is Danielle of Sometimes Sweet. She also offers a roundup post for her sponsors and gives you the option of being included in a giveaway. Even though she’s a new mom, I still got a ton of traffic from her because her other content is similar to things I like to post about. The moral of the story is that you should sponsor a blog that will do what they can to make sure you get the most for your money! Like I mentioned earlier, there are lots of sponsorship opportunities out there at varying price points. One of the most important deciding factors when choosing a blog to sponsor is whether or not you can afford to do so. Some of the sponsor spots on Elsie’s, A Beautiful Mess are as much as $800 for a month. I don’t know about you, but I can’t afford that! Decide what your budget is for a sponsorship and if a blog meets all of your other criteria AND falls into your budget, then I’d say it’s a great blog to sponsor. One tip for making the most of your sponsorship funds is to secure a package rate. I often purchase three-month sponsorship packages as they are offered for a reduced rate. This is a great way to maximize your sponsorship opportunities! I bought my sponsorship! Now what? Generally once you secure your spot, the blogger will ask you to provide a button. If you don’t know how to make one of these, there are countless tutorials online. I would try to explain it, but I’m not so great with the html code writing and I don’t want to steer you in the wrong direction. You can try using this tutorial which is a lot more helpful than I am! Bloggers will generally specify what size the image must be. I always like to include the name of my blog in the image along with a picture that I’ve taken because it lends a bit of personality to my image. Try to make something that will stand out amongst the rest of the buttons on the sponsors blog. Once you submit your button, sit back and relax! Krysten–It's definitely good stuff to keep in mind no matter which side of the sponsorship you're on :). These are some really great tips! I have people sponsoring my blog and I'm about to start turning the tables a bit. We'll see how it goes!P.S. I'm hosting a giveaway today, you should come check it out! Thanks for posting this! I've toyed with the idea of sponsoring other blogs (maybe sometime a little further down the line) and didn't know very much about it. Your post was definitely helpful and gave me some things to think about.